Glitter Grammy Plays With Paper: Two posts in one month....I am on a roll! Hello and can you believe it....I am on a roll.....2 posts in one month. Really though, I am sad that I am not doing many more. I am creating. I just don't seem to find the time to show what I've made. So, here goes. A group of gals try to get together on Thursdays. One Thursday I teach a class. One Thursday Karen teaches a class and two Thursday's a month we play. Yesterday was a play day. I went planning to work on an album, but I was distracted by new product. Can you believe that...distracted! Kaiser Craft has a new line and this paper is called Mademoiselle. One side of the paper is patterned and one side has great graphics. You can see which one I chose. I used another on the inside but you'll see that in a bit. Karen also brought Foam fronts into the shop and I couldn't say no to the oval. There are about 4 other shapes....don't worry, I'll be making more of these. Anyway. She also has lovely bottles of buttons, pearls, sequins and seed beads. The colors all go so well together and the accent color of blue added perfect interest. 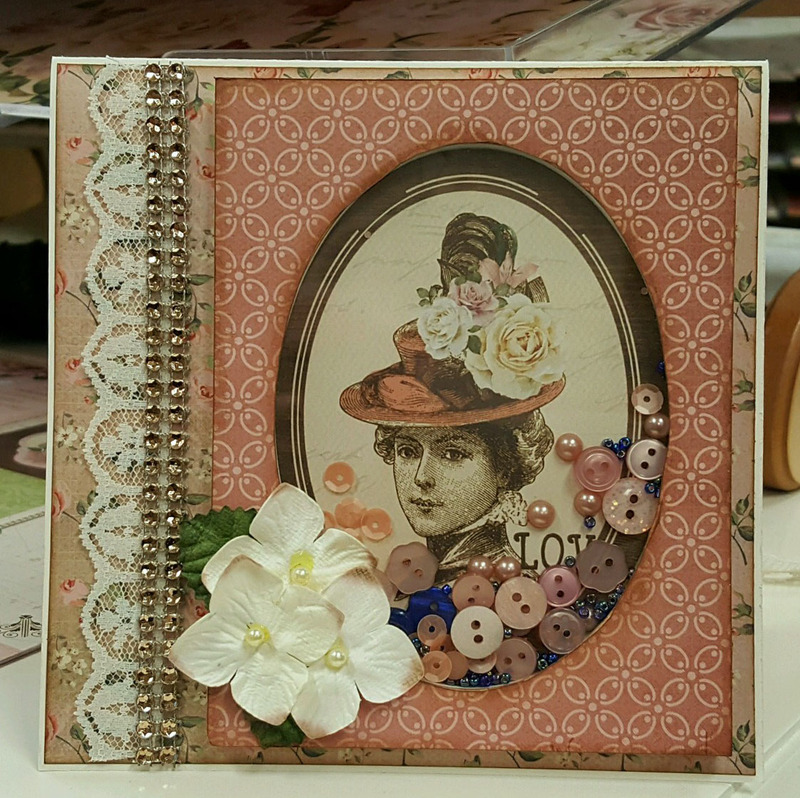 I added a few flowers, some ribbon and bling and this card is done. Well the outside is. 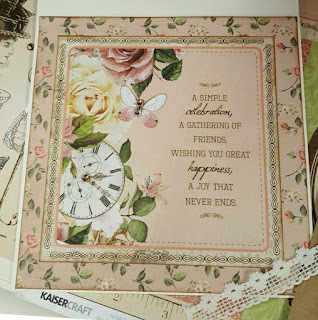 The Graphic side of the Kaiser Craft paper made the perfect sentiment. I love it when cards come together quickly and this one did. The tiny little flower paper is also from Kaiser. I guess I should think about my post for Sparkles Christmas Challenge. That is coming up quickly. So, until next time....Happy Crafting. This is beautiful. 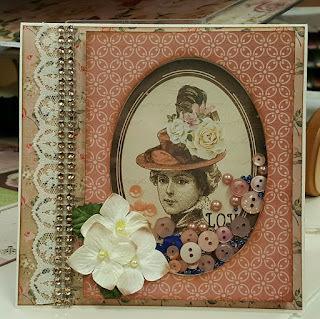 I love the vintage look you have achieved and wow those buttons do look fab around the oval. Hugs Mrs A.